Makin' it in Memphis: Sweet Melissa. If you peek in the background of that pic, you can see my project for a bridal shower coming up!! I was working on the favors. 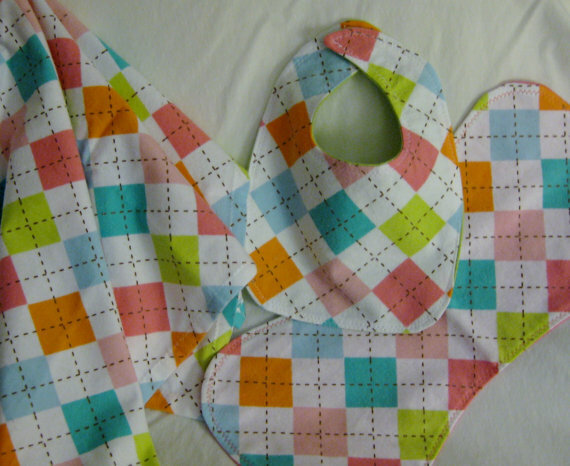 I got a baby blanket, bib, and burp cloth set off etsy from this shop, Sew Divine. She hand makes everything and her proceeds go to orphans around the world. She's the mom of one of my favorite bloggers and pretend friend, Katie from Marriage Confessions. The baby set was just too cute to pass up and since little Melissa is going to just be so cute and styling, I had to get it for Rachel's baby shower. Having no babies of my own, I can't vouch for how practical they are but Katie of Marriage Confessions fame swears up and down by the burp cloths - which is good enough for me. Gotta love fun afternoons out with girlfriends to reenergize your spirits! Burp cloths are a MUST :) Don't you think it's time for a little Jasper???? I hope you have a great summer and enjoy your time off from school. Ha, Alissa - no little ones for us yet. Gotta get Jake through school so their dad would actually be around!! !